We began this book with the combustion of cellulose, a polymer of glucose, and progressed to spinning yarn from protein fibers. We have selectively dissolved the polymer, lignin, from plant stems to produce paper and we have converted cellulose into a different polymer, nitrocellulose, to produce collodion film. If we wished we could dissolve cellulose in a solution of copper sulfate and ammonia to produce cuprammonium rayon, but we would merely be making one polymer from another. We might also try our hand at Bakelite or neoprene, but these polymers were created "in the dark," so to speak, with no real understanding of what it was about these substances that gave them the properties commonly associated with polymers. No, polyesters were the first polymers to be created "on purpose," that is, with some clue as to what structural features of a monomer might promote polymerization. For this reason we shall peruse polyesters in particular, pointing out principles also applicable to polyamides and proteins. Carothers' greatest contribution to science was to suppose that polymers might be designed using known chemical reactions. One of the kinds of reactions we have seen time and again has been the condensation reaction, one in which two molecules join together, spitting out a small molecule such as water. We saw cellulose condense from glucose, and protein from amino acids in Chapter 6, ethyl acetate from ethanol and acetic acid in Chapter 16, fats from glycerol and fatty acids in Chapter 19, and acetanilide from aniline and acetic acid in Chapter 26. Carothers did not know that cellulose and proteins were condensation polymers, but he did know about the structure of fats, ethyl acetate, and acetanilide. He wondered whether it might be possible to build up large molecules from small ones using condensation as the means for linking them together. How, then, might it be possible to hook more than two molecules together? When ethanol reacts with acetic acid, the -OH part of the alcohol reacts with the -COOH part of the acid. The product, an ester, has neither an -OH nor a -COOH group with which to hook onto a third molecule. But what if we could devise an alcohol with two -OH groups? Then it would be possible to hook an acid onto each of them, forming a larger molecule from three smaller ones. Similarly, if we could devise an acid with two -COOH groups, it would be possible to hook an alcohol on each of them, again forming a larger molecule from three smaller ones. Now here comes the genius part; what if we were to react a di-alcohol, one with two -OH's, and a di-acid, one with two -COOH's? Well, when the di-alcohol hooked onto the di-acid, the resulting ester would still have an -OH at one end and a -COOH at the other. The -OH could hook onto another di-acid, whose -COOH could hook onto another di-alcohol, whose -OH could hook onto—well, you get the picture. The condensation product of a di-alcohol and a di-acid could be very long indeed. And if these long molecules were to have properties similar to those of known polymers, if they could be drawn into fibers or stretched into films, we might reasonably conclude that they were new polymers, polyesters. So to make our polyester, we need a di-alcohol. We have already been introduced to a tri-alcohol, glycerol, in Chapter 19. The beginning of the twentieth century saw increased production of the most common di-alcohol, ethylene glycol, introduced in 1927 by Union Carbide as an automotive anti-freeze. Ethylene glycol began to be manufactured from petroleum rather than coal tar and from the roaring twenties on, petroleum companies like Standard Oil and Shell began to compete with established chemical manufacturers. The anti-freeze used today is essentially pure ethylene glycol with a little dye added to make leaks easier to spot. Ordinary anti-freeze will be our source of ethylene glycol. We also need a di-acid; from the last quarter of the nineteenth century, one had been produced by the coal-tar industry for the manufacture of dyes and pharmaceuticals. Phthalic acid was traditionally produced by the oxidation of naphthalene, a coal-tar distillate familiar as the stuff from which moth balls are made. As with other chemicals, oil companies learned to make benzene, toluene, phenol, aniline, naphthalene, and other traditional coal-tar products from petroleum and today both ethylene glycol and phthalic acid are manufactured primarily from oil rather than from coal. We will actually find it more convenient to use phthalic anhydride for our condensation, just as we used acetic anhydride for the condensation of acetanilide from aniline in Chapter 26. I suppose that you could try making your own phthalic anhydride from moth balls, just as you made nitrocellulose from cotton in Chapter 27, but otherwise you will have to get it from a chemical supply company. Equation 28-1 shows what happens when ethylene glycol reacts with phthalic acid. The product, ethylene glycol monophthalate, has an -OH at one end and a -COOH at the other, just as we imagined a few paragraphs ago. When two ethylene glycol monophthalates get together, they undergo consensation, spitting out water and joining together to form a larger molecule, a di-ester. A free -OH remains at one end and a free -COOH at the other and the process of polymerization can continue indefinitely to form a polyester, polyethylene phthalate. The properties of phthalic acid lend themselves to the laboratory preparation of a polyester, but the melting point of this particular polyester is too low for commercial use as a fiber or film. A very small change of reactants, however, produces polyethylene terephthalate, trademarked as Dacron for use as a fiber, and Mylar for use as a film. Polyethylene terephthalate is quite familiar to caveman chemists; it is the stuff from which the 2-liter soft-drink bottle is made. The "very small change" is the substitution of terephthalic acid for phthalic acid. These two compounds are isomers of one another; they have the same molecular formula but different structures. In phthalic acid the -COOH groups are next to each other, in terephthalic acid they are on opposite sides of the aromatic ring. Other than the conditions of temperature and pressure used for the commercial synthesis, the polymerization of polyethylene terephthalate is the same as that of its cousin, polyethylene phthalate. Polyesters were the first synthetic fibers to be prepared by Carothers and his team at DuPont, but their first commercial success in this area was the polyamide, Nylon. Whereas polyesters are condensation products of acids and alcohols, polyamides are condensation products of acids and amines. Just as different polyesters result from the choice of acid and alcohol, different Nylons result from the choice of acid and amine. The most common Nylon, Nylon-66, results from the condensation of the six-carbon adipic acid and the six-carbon hexanediamine. At least one Nylon, Nylon-6-10, can be conveniently produced in the laboratory. Two natural polymers, protein and cellulose, have played a prominent role in the history of technology. Figure 28-1 compares the structures of these compounds to their synthetic progeny. 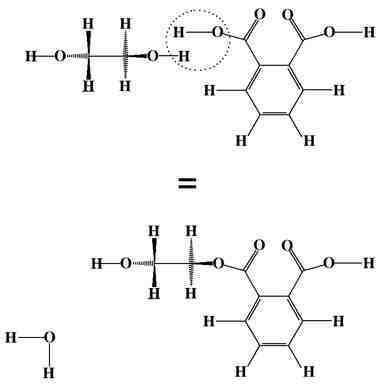 Each structure shows two monomer units with the exiting water molecule circled. 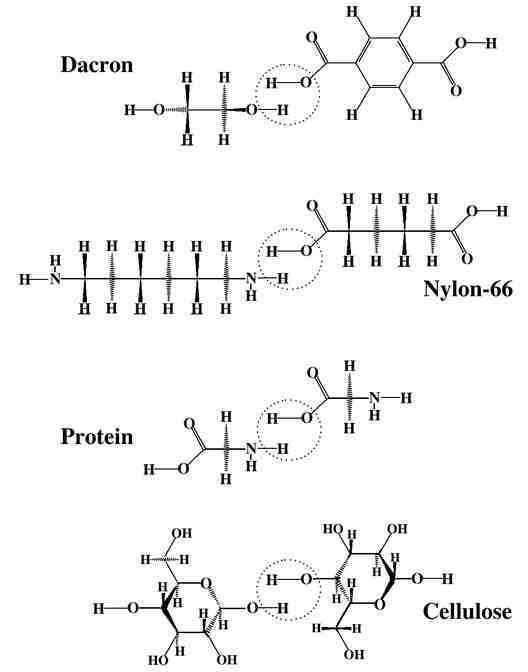 The proteins are a particularly varied class of polymers because there are twenty amino acid monomers to choose from and they can be strung together in a bewildering number of combinations. The monomer chosen for the figure is the amino acid glycine. Cellulose is a polymer of glucose, one of the principle sugars in honey. It has been central to the story of textiles and paper, industries which created the demand for dyes and alkalis. It gave us collodion, celluloid, and rayon as antecedents to the synthetic polymers. It is fitting that we should end our exploration of chemistry here, for cellulose was the material from which we started the fire which launched us on our long journey from caveman to chemist way back in Chapter 1. Locate MSDS's for ethylene glycol (CAS 107-21-1) and phthalic anhydride (CAS 85-44-9). Summarize the hazardous properties in your notebook, including the identity of the company which produced each MSDS and the NFPA diamond for each material. Your most likely exposure will be to spilled ethylene glycol. Wash your hands when you have finished this project. You should wear safety glasses while working on this project. Leftover solid materials can be thrown in the trash. Leftover ethylene glycol should be saved for re-use or collected for disposal wherever automotive products are sold. Ethylene glycol, like all alcohols, is toxic by ingestion. Its sweet taste makes it particularly attractive to unsuspecting animals and so care must be taken in its disposal. You should know the Research and Development points from Chapter 23 and Chapter 24. You should know the hazardous properties of phthalic anhydride, ethylene glycol, and sodium acetate. You should know the reaction of Equation 28-1. You should be able to sketch the structures shown in Figure 28-1. You should be able to describe the condensation of esters and amides. You should be able to tell the story of Wallace Carothers. There are a bewildering variety of synthetic polymers, of which the condensation polymers make one class. The other class, the addition polymers, includes polyethylene, polyvinyl chloride, polystyrene, polyisoprene (natural rubber), neoprene, Teflon, Orlon, and Plexiglas. See Reference , p. 213.